All the operations that you perform on a data such as searching, sorting, insertion, manipulation, deletion etc. can be performed by Java Collections.Collections in java is a framework that provides an architecture to store and manipulate the group of objects. Java Collection simply means a single unit of objects. Java Collection framework provides many interfaces (Set, List, Queue, Deque etc.) 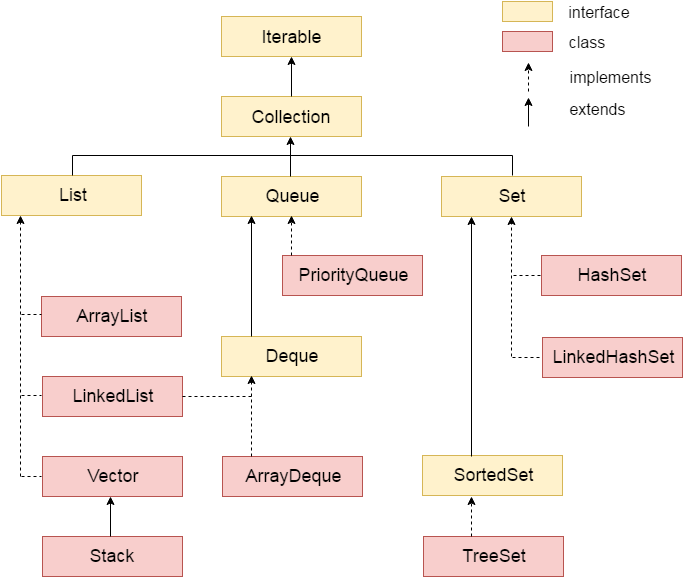 and classes (ArrayList, Vector, LinkedList, PriorityQueue, HashSet, LinkedHashSet, TreeSet etc). Collection represents a single unit of objects i.e. a group. represents set of classes and interface. Hierarchy of Collection FrameworkLet us see the hierarchy of collection framework.The java.util package contains all the classes and interfaces for Collection framework. 1 public boolean add(Object element) is used to insert an element in this collection. 2 public boolean addAll(Collection c) is used to insert the specified collection elements in the invoking collection. 3 public boolean remove(Object element) is used to delete an element from this collection. 4 public boolean removeAll(Collection c) is used to delete all the elements of specified collection from the invoking collection. 5 public boolean retainAll(Collection c) is used to delete all the elements of invoking collection except the specified collection. 6 public int size() return the total number of elements in the collection. 7 public void clear() removes the total no of element from the collection. 8 public boolean contains(Object element) is used to search an element. 9 public boolean containsAll(Collection c) is used to search the specified collection in this collection. 10 public Iterator iterator() returns an iterator. 11 public Object toArray() converts collection into array. 12 public boolean isEmpty() checks if collection is empty. 13 public boolean equals(Object element) matches two collection. 14 public int hashCode() returns the hashcode number for collection. Iterator interface provides the facility of iterating the elements in forward direction only. 1 public boolean hasNext() It returns true if iterator has more elements. cursor pointer to the next element. 3 public void remove() It removes the last elements returned by the iterator. When I studied Java, it was maybe one of the best and the easiest theme for learning for me, unlike the theme about java list vs arraylist https://explainjava.com/list-java/ that I learned only from this service not so long time ago, so I can surely say that this is reliable and helpful site, especially for beginner in such hard language as Java.